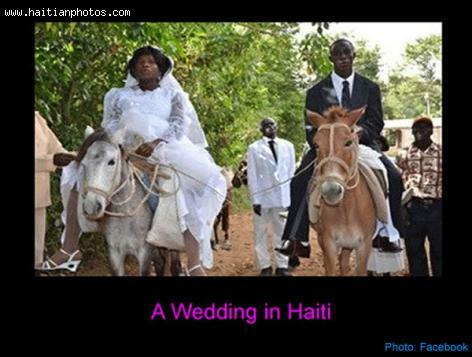 It's a wedding day in Haiti. Be it the Haiti on Hispaniola or the one in the hearts across the Diaspora, a Haitian wedding tradition permeates through geographical and economic boundaries. The customs set out to usher a new couple into their married life are simple, poignant traditions that are quickly being adopted by people outside the Haitian sphere, while being simultaneously forgotten by those within it. No one is formally invited to a Haitian wedding. This is perhaps one of the first differences between other wedding traditions. It is also one of the reasons why the customs are currently mostly practiced within the rural areas, where word of mouth gives an individual access to a wedding celebration. Wedding goers will sprinkle the streets along which a groom will lead his bride to the church. It is a journey she doesn't make alone, as her bridesmaids often accompany her for the walk. The church is often brightly decorated with colorful swaths of cloth, and the bride takes a seat facing her groom with their maid of honor and best man, respectively, seated beside them. Behind the groom sits the witnesses, and the entire bridal party signs the marriage certificate as a part of the official ceremony. At the reception, the newly married couple, their witnesses, and less often, the bridesmaids, are seated at formal tables. However, food prepared by family members of the husband and wife is shared with all and gifts are given to the couple. A major difference is that the cake is never cut at the reception, but in the marriage home a few days later. I am not aware of this tradition.